As an economic historian, Christina Romer did some useful and interesting things. A well-regarded piece she wrote is this one which, in the 1980s, challenged conventional views about business cycle volatility. At that time, conventional wisdom was that volatility in aggregate economic activity in the United States was much higher in the pre-World War II period than after. That conventional view was certainly consistent with Old Keynesian ideas about policy intervention. Keynesians wanted us to think that post-World War II macroeconomic policy, enlightened by Keynes, Hicks, Samuelson, Tobin, and others, had served us well. Before Christian Romer's work, existing measurement told us that volatility in real GDP was smaller after World War II, consistent with the efficacy of active stabilization policy. Romer did a careful job of the historical measurement, and found that much of the difference in pre-WWII and post-WWII volatility found by others could be explained by measurement error. The result was all the more striking for its intellectual honesty, coming from a committed Keynesian who had come out of a strongly Keynesian academic environment (MIT Economics Department in the 1980s). I was reading the Sunday New York times and ran across this, which made me quite happy (for the state of the world) that Christina Romer was back to doing economic history and no longer trying to guide macroeconomic policy in the Obama administration. Romer's NYT piece, and what I will discuss here, serves as a useful bookend to what I wrote here on her fiscal policy views, which are very much in line with Krugman's, i.e. the no-amount-of-intervention-is-too-much school. Romer first wants to tell us that the old "hawks vs. doves" characterization of FOMC decision-makers is no longer relevant. Apparently everyone is now a hawk. Now, that does not seem right. It seems to me that what people mean by "dove" is "Keynesian." On the FOMC, Janet Yellen, Eric Rosengren, Charles Evans, and Bernanke himself are clearly Keynesian. Yellen and Rosengren are more Old Keynesian, and Bernanke and Evans are more New Keynesian. Yellen/Rosengren/Evans/Bernanke were likely the serious force behind the Fed's mortgage-backed securities purchases and the recent QE2 operation. Seems to me there are plenty of doves in sight. So, if "hawks and doves" does not work so well as a characterization of FOMC members, what is Romer's alternative? Apparently these people are either empiricists (translation: good people) or theorists (translation: bad people). In academic life, it would be fairly easy to take individual published articles and classify them as theory or empirical, i.e. quantitative work. We are not going to find much quantitative work in the Journal of Economic Theory (though there is some), and not much pure theory in the Review of Economics and Statistics. Of course, one cannot do good empirical work without theory to put structure on it, and one does not do good theory for the sake of amusing oneself (we hope) but to ultimately explain how the world works and possibly to permit the design of better economic policy. Clearly any good macroeconomic policymaker has to be thinking about theory and empirical work. He or she has to have a good grip on macroeconomic measurement (available data and the quality of that data), empirical macroeconomic research, and theory. One cannot hope to contribute to the policy discussion and aid in making decisions without walking both sides of the fence. Now, I think what Romer wants us to think is that people like Charles Plosser, Narayana Kocherlakota, Jeff Lacker, and Jim Bullard, for example, are theorists, i.e. bad guys, who have their heads in the clouds. I know all of those people well, and nothing is further from the truth. Kocherlakota for example has an excellent grip on most of what is useful in modern economics. As an academic, he did quantitative work (he can estimate and calibrate) and high-end theory, and he can articulate cutting edge economic ideas in a straightforward way to lay people and other policymakers. Plosser/Koherlakota/Lacker/Bullard have all proved to be effective leaders and decision-makers who have put to work the ideas they absorbed as economic researchers and teachers. Empiricists, as the name suggests, put most weight on the evidence. Empirical analysis shows that the main determinants of inflation are past inflation and unemployment. Inflation rises when unemployment is below normal and falls when it is above normal. I would like to add something that's not essential to the science, but something I kind of believe, which is that you should not fool the layman when you're talking as a scientist. I know about research by Andy Atkeson and Lee Ohanian that finds, in contradiction to what Romer states, that once we know past inflation, knowing unemployment does not help us forecast future inflation. As well, Romer is not filling the layman in on the fact that there is a long line of research in macroeconomics that attempts to sort out the Phillips curve relationship that is at the heart of her argument. The upshot of that research is that the empirical Phillips curve relationship is in the data for some time periods and not for others, and that (New Keynesian economics notwithstanding) the sometimes-observed Phillips curve is not a structural relationship. Romer discusses this as if she knows what a "normal" unemployment rate is, which any good economist knows she doesn't. Finally, what are Romer's policy conclusions? As a confirmed empiricist, I am frustrated that the two sides have been able to agree only on painfully small additional aid for a very troubled economy. Romer has come to the conclusion that the planned purchase of $600 billion in long-maturity Treasury securities by the Fed is somehow not enough, and "painfully" not enough, and she is willing to state that in the Sunday New York Times. What would be enough then? Would $800 billion work? Would $2 trillion work? What is the objective exactly? 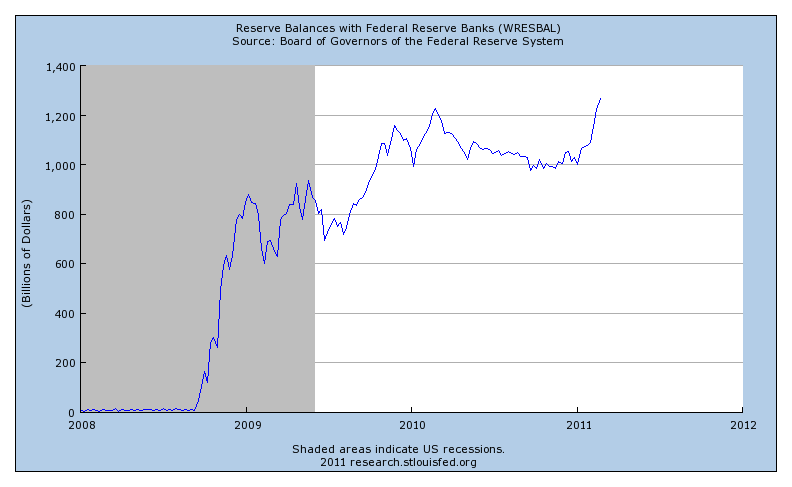 At one time an expansion in the size of the Fed's balance sheet of this magnitude would have been considered ludicrous. How does this work differently? Does confirmed empiricism involve making guesses based on how you feel when you wake up in the morning, or what? [The Fed] could set a price-level target, which, unlike an inflation target, calls for Fed policy to take past years’ price changes into account. That would lead the Fed to counteract some of the extremely low inflation during the recession with a more expansionary policy and lower real rates for a while. Unfortunately for Romer's argument, a price-level targeting approach will not necessarily give her the conclusion she seems to want. 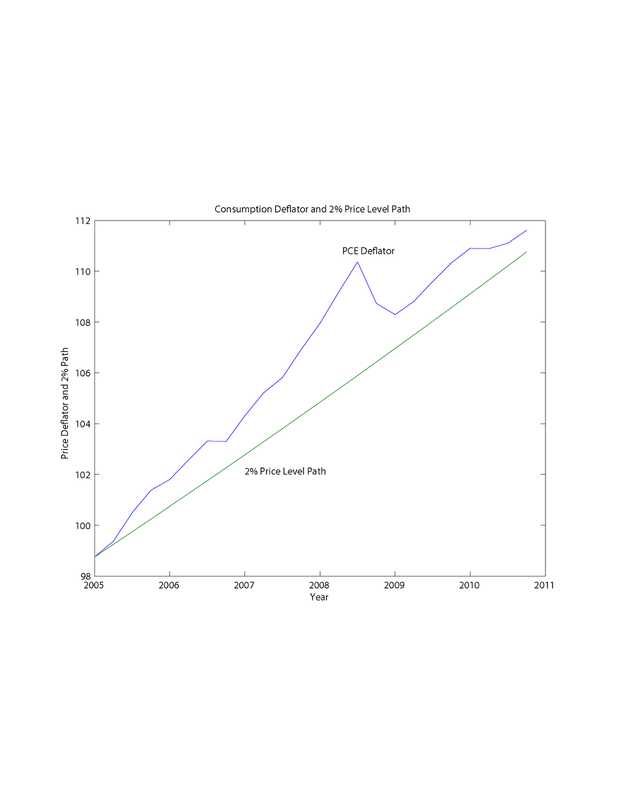 In the chart, if we take the personal consumption expenditure (PCE) deflator as our price level target measure, and take the base period as first quarter 2005, for example, the 2% annual-growth price level path is still well below the actual PCE deflator for fourth quarter 2010. If you take the base period for the target price level path as the peak in 2008, we are certainly on the low side of the desired path, but a base period any time before spring 2007 would imply that the price level is currently too high. And any [of her alternatives] would be better than doing too little just because some Fed policy makers believe in an unproven, theoretical view of how inflation works. Of course Romer's theoretical view is pretty much that of Samuelson and Solow, from 1960. Apparently the Fed can increase the inflation rate only by reducing the unemployment rate, and moving the economy up the Phillips curve. Romer says some things about economic history in her piece, but of course she is very selective, and seems to want to ignore the period in US economic history and in macroeconomic thought that runs from about 1968 to 1985. Let's review that. (i) Samuelson/Solow and others think that the Phillips curve is a structural relationship - a stable relationship between unemployment and inflation that represents a policy choice for the Fed. (ii) Friedman (in words) says that this is not so. There is no long-run tradeoff between unemployment and inflation. It is possible to have high inflation and high unemployment. (iii) Macroeconomic events play out in a way consistent with what Friedman stated. We have high inflation and high unemployment. (iv) Lucas writes down a theory that makes rigorous what Friedman said. There are parts of the theory that we don't like so much now, but Lucas's work sets off a methodological revolution that changes how we do macroeconomics. One of the things we still like about Lucas's work is his "critique" paper, which tells us why we need theory to make good policy decisions. The key example from the Lucas Critique paper is the Phillips curve: treating an observed correlation in the data as structural can be bad. (iv) Paul Volcker takes Friedman seriously. Friedman had said that "inflation is everywhere and always a monetary phenomenon." The confirmed empiricists are skeptical. They seem to think that the Phillips curve is very flat, and that there will have to be a very long period of very high unemployment to bring the inflation rate down. Not so. Volcker engineers a severe monetary contraction and the ensuing recession is fairly painful, but not so long. Success! Inflation comes down quickly and has remained low since then. What's missing from Romer's piece? It's the "inflation is everywhere and always a monetary phenomenon" part. Of course we have learned a lot since Friedman said that, about the practical implementation of monetary policy, and about monetary economics. Targeting the growth rate in some monetary aggregate does not seem to be a good idea. In the very short term, setting a nominal interest rate target for some overnight interest rate seems to work pretty well. When there is a large quantity of reserves in the system, swapping reserves for T-bills has essentially no effects. Monetary expansions that are planned to be reversed, and expected to be reversed, can have no effects. We know little, theoretically or empirically, about the effects of large purchases of long-maturity assets by the Fed under the current circumstances, but we are going to learn something about that soon. Here's what I see in the recent data. The first chart is reserves, since the beginning of 2008, and the second is currency in circulation. The total of these two is total outside money, which is roughly the total quantity of Fed liabilities financing its asset portfolio. In the first chart we see a rapid runup in last few weeks in reserves. For reasons I discussed in other posts, the actions of the Treasury caused a lag in the effects of the QE2 asset purchases by the Fed on outside money, but those actions have been reversed. In the second chart, currency in circulation has increased substantially in recent weeks. Year-over-year percentage increases in the stock of currency in circulation have exceeded 6% since early this year and are approaching 7%. This is potentially serious. Increases in outside money that show up only as increases in reserves are currently irrelevant for inflation, but when this shows up as currency, it can matter. If the recent increases in the currency stock do not represent increases in the real demand for currency in the world, this has to be inflationary. The Fed is only halfway (and less than halfway in terms of published data) through its QE2 program, and if increases in the currency stock continue at the rate of the last few weeks until the end of program, we should be genuinely concerned, Christina Romer notwithstanding. I think that I am relatively hawkish, on your pantheon. Still, I am not sure that I am very worried about the 6% increase in currency circulation. What will real GDP growth be this year? The January Board/FOMC real GDP growth projections ran from 3.2 to 4.2 percent, for example. Let's call it 3.5. Suppose that velocity is stable and the "excess" currency growth translates into equal aggregate growth and inflation. Let's ignore lots of issues with domestic and foreign demand for US currency and velocity. I'll bet that 6% is not far from the average US currency growth over the last 40 years. Are you worried about 2.5 percent inflation? Am I missing something? It might be a problem, yes, but I don't see it as obvious. It's approaching 7%, which is year-over-year. If you look at the increase in currency outstanding since the beginning of QE2, that is about 10.8% at an annual rate. If you factor in the fact that the Treasury appears to be dumping the $125 billion in its supplementary reserve account, and the $1.27 trillion in private reserve balances that are currently sitting there and will increase substantially by the end of June, I think you have a problem. Also, in a zero interest rate environment, we should not be surprised if people choose to hold a lot of cash. I'll have to give the Treasury's actions some thought. I suppose that private demand for currency and excess reserves will determine its implications. We should keep an eye on all of it, of course, but I am not ready to hit the panic button yet. I agree with your last sentence. I'm not saying that this is the time to tighten, but it all bears watching. When you are in uncharted territory you want to keep your eyes open. Currency in circulation may have increased in the last two weeks uncharacteristically more than usual - and you are absolutely right that under normal circumstances it would be a cause of inflationary concern but not in this case when this increase comes from unusually depressed levels. For example, the ratio of currency in circulation to GDP is still close to all-time lows. Even more so if you look at currency in circulation to global GDP - let's not forget that USD is still the reserve currency of the world and we need a global yardstick when looking at US economic data, not just a domestic one. Sure, a few weeks is not much evidence. This could be a blip. I have not looked at the time series of currency to nominal GDP (inverse of currency velocity) recently, but this went up substantially in the recession (as you see in the picture). It is not at an all-time low. If we take account of the global demand for US currency, the concern should be greater. Presumably the demand for US currency in the world increased during the financial crisis, and that effect is reversed as the effects of the crisis wane. "If the recent increases in the currency stock do not represent increases in the real demand for currency in the world, this has to be inflationary." How could that be? Please explain. Increase in currency stock is always demand driven. 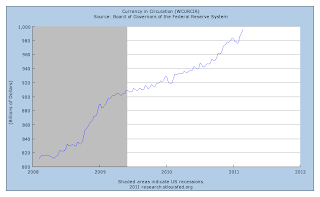 The supply of outside money (currency plus reserves) is determined by the Fed. Then, the behavior of financial institutions with reserve accounts, and people in the world who hold US currency (the demand side) jointly determine how the total stock of outside money is split up between currency and reserves. Now, suppose for simplicity that the demand for currency in real terms is fixed (inelastic with respect to everything). 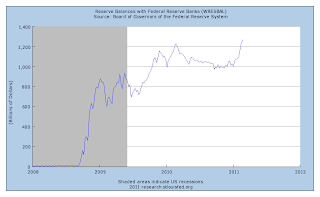 Now, suppose that the Fed buys some T-bonds, and there is a corresponding increase in reserves. Now, suppose that given current asset prices and prices of goods and services, that financial institutions don't want to hold those extra reserves. One thing that could happen is that the price level could rise. Ultimately, the real stock of currency is unchanged, the nominal stock of currency has risen, and the real stock of reserves is unchanged. Thus currency increased in nominal terms, but this certainly was not demand-driven as the real demand for currency is fixed. Just an example, but I hope you get the idea. I still don't really see how you can have sustained and accelerating inflation (at a reasonable level, not Wymar everything's in disarray), with high unemployment (of people really willing and able to work). Once prices start rising, a lot of people won't put off purchasing, plus their real debts will start shrinking faster. Also, real wages will go down. This will cause more hiring and un-mothballing of productive facility, which will cause more supply which will limit the inflation – and this will continue to keep a lid on inflation until the excess human and physical capacity is no longer there to draw on and keep supply of goods increasing with the supply of dollars. What flaw(s) do you see in this story? Plus, what even causes the inflation? It's people spending these hoards of newly prited money. But when they spend it, it creates the incentive to hire more to keep up with the new greater demand, and when the companies hire more, they produce more, and the new supply puts a lid on the price increases. And this keeps working until there's no more excess workers and facilites to ramp up. Richard --- inflation in the UK is sustained and accelerating despite high unemployment and supposedly high levels of spare capacity. Perhaps you could comment? 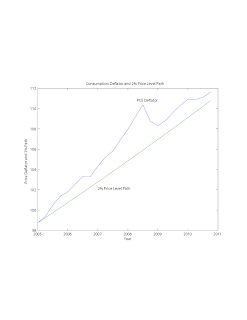 Hyperinflations, while of course extreme, are instructive in this instance. Prices are increasing at an extremely high rate, but there is nothing good about it. A hyperinflationary economy is dysfunctional. You're not going to see smoothly operating labor markets, high employment, and a low unemployment rate. Yeah, but like I said, "at a reasonable level, not Wymar everything's in disarray". I could see that with hyperinflation, you lose the ability to conduct transactions and contracts smoothly and easily; there starts to be great difficulty in coordinating economic activity, in utilizing human and physical resources, but with inflation at 5%, or even 10%? It's not like the currency will start to not function and people will have trouble making exchanges and contracts and doing planning. You cannot experience hyperinflation in credit based monetary system (in other words what we have had in the developed world since the early 90s). Or can we? In order to have hyperinflation you need a massive increase in the actual money in circulation not just the credit/debt based money supply. And in 2008, after Lehman, the monetary base exploded, the cash in circulation rose proportionally much less. Are there any historical examples of hyperinflation occurring in a credit based money supply system? Read Sargent's paper. What is interesting about it is that he is writing in 1981 about hyperinflations, but he is making an argument that this applies to the then-recent inflation experience, which was the 5-10% you are talking about. It's hard to tell from your picture, but you look like you could be under 40, which means you either were not around in the 1970s or don't remember much about the 1970s inflation. There was a lot of grumbling during that period - not a happy time at all in terms of how everyone felt about their economy. Read Chapter 18 of my 4th edition textbook (macroeconomics), and pay close attention to the 1970s experience - high inflation sometimes coupled with high unemployment - and the story about the shifting Phillips curve relationship. Why do you say we have a credit-based money supply system? Pre-financial crisis, most of the stock of outside money (the liabilities of the Fed - currency and reserves) was currency. The quantity of reserves was tiny. After the financial crisis, there was a huge increase in reserves, but most of those reserves just sit. They are not being used in transactions and play a similar role to Treasury bills. Currency is not going away. Currently, the quantity of US currency held in the world at any given time is about 6% of annual US GDP - a big number. Currency holdings are even higher in some other countries - Japan and Switzerland for example - and currency is still very widely used in the world. Now, even if there were no currency, there can still be a role for central bank liabilities - reserves - in daily clearing and settlement in the payments system. In such a world you could still have a hyperinflation, if fiscal policy gets out of control and the central bank resorts to issuing central bank liabilities at a high rate to finance an ever-increasing budget deficit. Richard said, "I still don't really see how you can have sustained and accelerating inflation (at a reasonable level, not Wymar everything's in disarray), with high unemployment (of people really willing and able to work)." OK. You want moderate but accelerating inflation, no hyperinflation but significant unemployment. Go look up data from Argentina, circa 2003. Inflation rose from about 0 in 2000-2001 to a high of 41 percent in 2003and then declined to the 5-10% range in 2005-2010. At the same time, unemployment rose from 14 percent in 2000 to 21.5 percent in 2003 and then fell back to 8 or 9 percent in 2007-2008. I haven't tried to document other cases because I have work but I strongly suspect that there are lots of other examples. A big problem with searching for examples in US data is that we have very few episodes of significant and rising inflation in the modern era and high unemployment has been confined to a few episodes as well. Steve, did you delete my comment, or was it just tripped up by a spam filter? I understand if it was overlong, but (in my opinion, at least) the length was matched by actual substance, and I'd appreciate some kind of response rather than a hidden deletion. Latin America indeed offers abundant evidence of high inflation and high unemployment. These "small economy" examples are typically dismissed as being too dependent on the external sector to be good analogies. Indeed, import prices appear, on the surface, to be a much more important inflation transmission vector in those countries than in the U.S. The true source of inflation in those countries, however, was the expectation that the central bank would persistently finance chronic and growing fiscal deficits. The thought was that this action would cause higher prices tomorrow, so best to buy everything you could inventory today. This "forward buying" led to generalized inflation, which then led to worker unrest and then higher wages. Its interesting that people put so much stock on organized labor. Those Tunisians agitating for lower food prices were hardly AFL-CIO members. Take down real workers' real wages fast enough, and they will find a way to threaten to supply less labor. I'll only delete comments if people get abusive. I did not delete yours. Google seems to have some limit on the length of a comment that you can post, but it does not seem to impose that on me when I post a comment. If you have trouble, email the comment to me directly, and I'll post it. I can't disagree with anything that you wrote and you put it nicely. Thanks. I will have to take your word about the greater pass-through in Latin American countries but I find this easy to believe. As you implicitly note, despite the relatively open nature of these smaller economies, inflation is ultimately a matter of domestic choice. I didn't really think that everyone would find my Argentina example completely convincing because of structural differences between the US and Argentine economies. But I thought that it did provide a useful counterexample to the idea that rising (but moderate) inflation is impossible with substantial unemployment. All right, thanks Steve, I guess Google was just telling me that I'm long-winded! (I was wondering because the comment seemed to show up for a minute or two but then went away... I guess there is some kind of delay in whatever filter got me.) I apologize for being suspicious, and I'll follow-up with a shorter comment at some point. Stephen, to answer your question " Why do you say we have a credit-based money supply system?" I am afraid I may have to email you separately as space here will not allow me to do that. 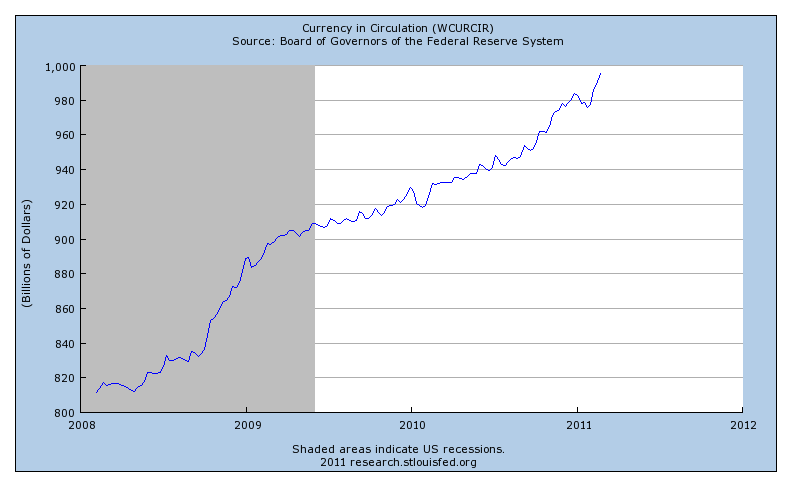 To elaborate on the distinction between what currency in circulation does compared to what the Fed does when it creates money supply I will refer to a post by Brad DeLong in relation to a post by David Beckworth which can be found here http://delong.typepad.com/sdj/2010/09/what-is-this-demand-for-money-of-which-you-speak.html . Again in the interest of space I will not quote all the relevant parts but the gist of the argument is the paragraph which starts with the sentence, "Increasing the money supply can help - but only if the Federal Reserve does it without it's policies keeping the supply of safe assets constant." So, to cut a long story short, you are absolutely right in a sense that "Currency is not going away". In fact what I am trying to say is that we need more of it (and potentially less of the money supply the Fed is creating). And you are also right that currency in circulation is only 6 percent of US GDP, but that is nothing compared to the same ratio in Japan (65), Switzerland (45), EU (35); only UK is close enough at 16percent. The US ratio is way way too low on a relative basis but also too low on an absolute basis if you take into account that the US dollar is the world reserve currency and that outside of the US a lot of transactions are actually physical rather than in electronic form. The world needs, demands more dollars different from the "ones" the Fed is "creating". The lack of US dollars contributed to the creation of the shadow banking system. But I am digressing. Finally on the topic of hyperinflation, I am also wondering whether such is possible at all to occur in a currency which is the reserve currency of the world. As far as I know all episodes of hyperinflation occurred in small closed economies. For example, during all of its global rein UK did not experience hyperinflation? 1. There is an issue about the roles played by all of the liabilities of the consolidated government. Currency is a particular liquid asset that is used in retail transactions in the United States (both legal and illegal). It is also used widely in the world at large for legal and illegal transactions, and also as a store of value for some people. Treasury bills particularly and also other Treasury securities are also important liquid assets, which are exchanged in financial transactions and used as collateral. Reserves play a transactions role in the payments system, but as reflected in current interest rates, reserves are actually less useful currently than are T-bills. 2. As regards currency in particular, one could make an argument that we need less of it, not more. The stuff is supporting various nefarious activities, including illegal exchange and tax evasion. 3. A hyperinflation in US dollars is certainly possible. Of course, once everyone sees that coming, the US dollar would no longer be a reserve currency. In fact, this could just be self-fulfilling. The world expects a hyperinflation in US dollars, and therefore abandon US dollars, which causes the hyperinflation. 1. Currency, Tbills etc. can all be used as substitutes for "safety assets" - that's exactly what I was referring to, even though in extreme cases only cash is the ultimate safety asset (amongst those). 2. I was making an economic argument for more currency not a sociological argument or whatever the word is - obviously for the purposes of crime prevention less currency in circulation the better. But that's not the point anyway. 3. This is not possible in the real world. You cannot just abandon the USDollar overnight as a reserve currency. I mean you can but that will then end the current financial system as we know it. It will be simply financial armageddon. 1. Currency is not very safe. It can be stolen. That's in part why we have banks. 2. I was making an economic argument. I'm not a sociologist. 3. Of course it's possible. For example, if the US government becomes even more irresponsible, ultimately the rest of the world will drop the US dollar as a reserve currency. There are good reasons why the Argentinian peso is not a reserve currency. If we behaved like Argentina, our role in the international monetary system would be similar to Argentina's. Well its August so we can evaluate Williamson's prediction: it was wrong there was no major inflation at all. It's worth mentioning that Williamson's understanding of Phillips Curve research is completely wrong because he ignores the distinction between short term and long term. Only in the long term is there no Phillips curve, because people's expectations change.